The individualized adaptive learning environment that alta provides to students was very appealing. 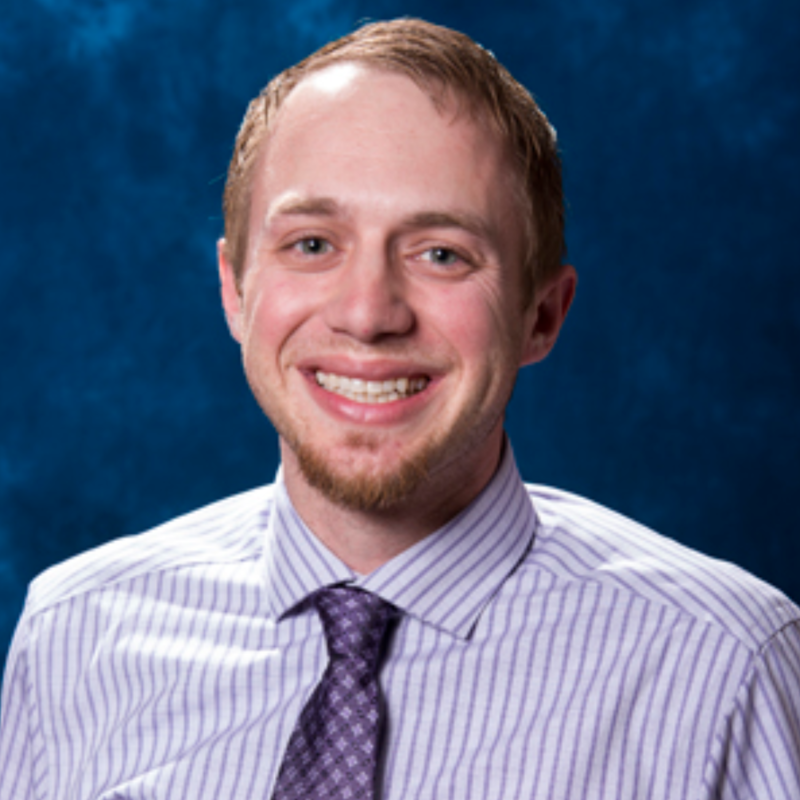 When you have a classroom filled with students of widely varying backgrounds in chemistry, it is imperative that students have an individually-tailored experience that helps each of them grow, learn and improve their success in the course. The second major factor was the number of conceptual question that alta uses; many times textbooks ask excellent numerical-based problems, but rarely do they ask the essential conceptual questions that probe if the student understands why they are doing the problem. Lastly, the in-depth explanation of topics, including worked examples for incorrectly answered questions, are simply fantastic on alta. Students truly appreciate a program that works to help them, not simply tell them they are right or wrong. Course grading centered on three components: Homework on alta (16-17%), in-class group quizzes using a classroom response system (12%), and summative exams (71-72%). Alta was used in conjunction with the printed textbook the department agreed to use across all sections. Students generally had a very positive response to using alta for an online homework system. They appreciated the relatively low cost and liked that they would have access to it after the semester was over (something many other homework systems deny students). They also really liked how alta provided them with thorough explanations and the chance to go back and practice topics. In fact, some students would get questions wrong just to see alta’s explanation. Overall, they seem to engage with the material better and did much better on conceptual questions, either on quizzes or exams. I evaluate student performance and retention of knowledge is through the administration of an external exam - in General Chemistry I and II, I use either the American Chemical Society’s First-Term General Chemistry Exam or the American Chemical Society’s Second-Term General Chemistry. This provides a consistent and impartial exam to evaluate student performance. The following table shows the average performance before using alta and this past year’s performance using alta. Please note: this data was selected for comparison as the only major difference between the before (pre-alta) and after is the use of alta. 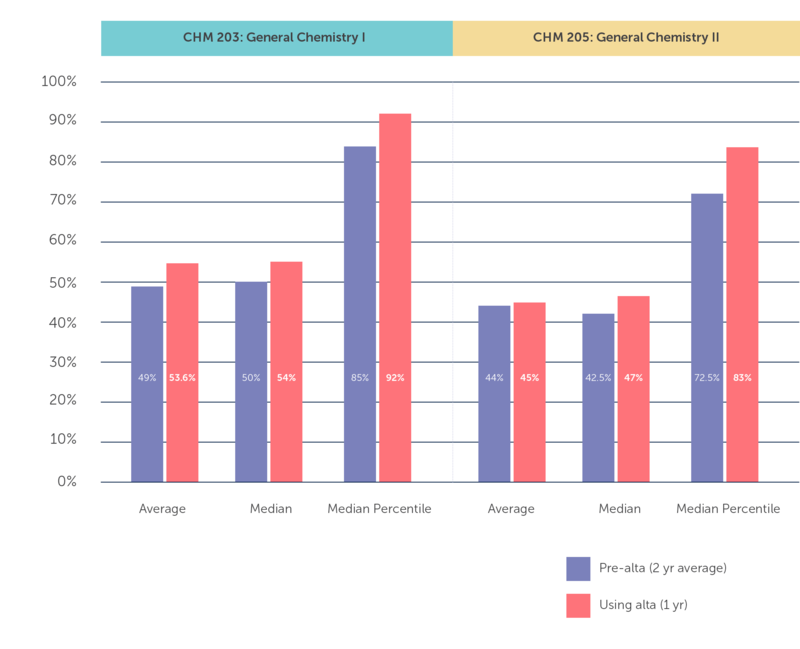 In both exams, the average and median score increased, with the median having a significant increase. The improvement seen in the latter is very exciting and shows that, especially the middle- to low-performing students, are showing meaningful improvement after using alta. 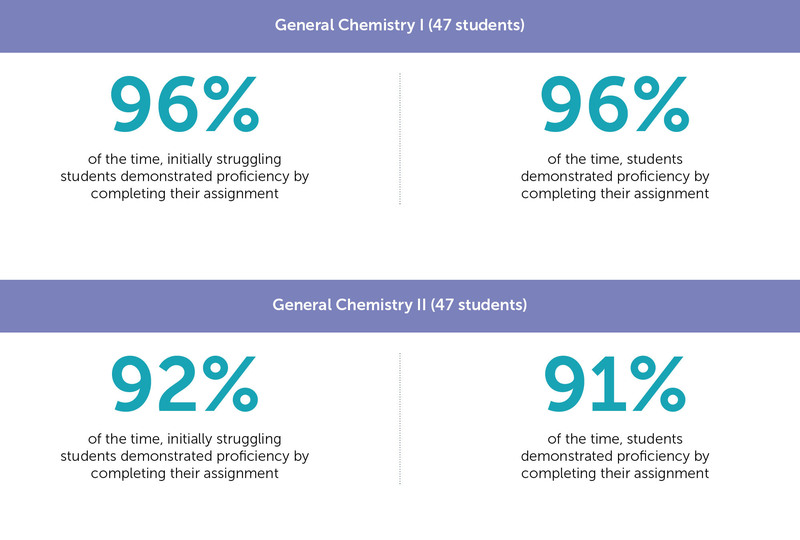 To measure alta’s impact on student proficiency, we analyzed the results that Eric's students achieved working in alta. These results indicate that a high percentage of struggling students, and students overall, reach mastery of learning objectives using alta. My best advice is just to create a few practice modules for yourself and see how wonderfully it works.